If I haven't said so already...I love love love the new shaker frames from Stampin Up. They are not so practical for mailing (thicker = extra postage) but they are sooooo cute! 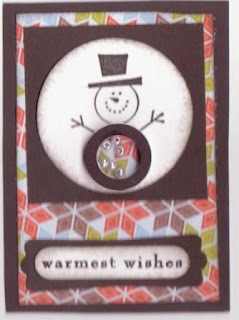 I made this snowman shaker ATC for a quick ATC swap on Swap-Bot (this one is headed to Ottawa). I love that the little microbeads look like snowballs in his tummy! The snowman is from the Button Buddies stamp set - too cute!